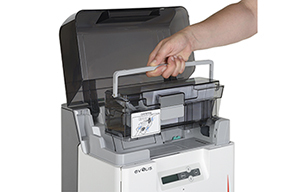 Evolis Avansia Retransfer ID Card Printer. Avansia retransfer ID Card Printer - The premium re-transfer printer for high definition printed plastic cards. Designed for heavy duty colour photo ID card printing with 600 dpi print resolution allows for perfectly rendered micro-text & watermarks to be printed in high definition full colour prints. The Avansia ID card printer is suited for high security card printing. Producing high quality double sided prints with over the edge finish. Retransfer technology (reverse transfer) maximizes print quality with 600 dpi resolution. Over the edge printing using Evolis High Trust® card printer consumables. The Avansia card printer has a built in flattener that applies pressure on the card to ensure a flat surface. 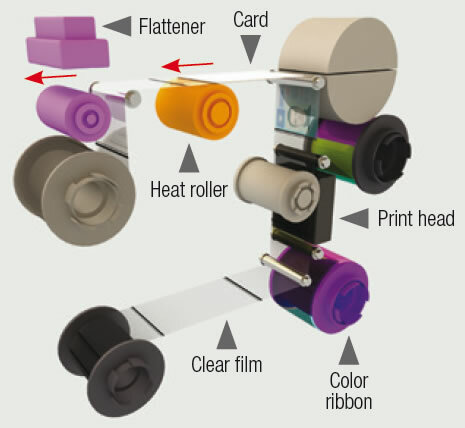 Other retransfer printers that do not have a flattener can produce warped or bent cards. How does Retransfer card printing Technology Work? The Card design is printed by Dye Sublimation on a transparent film. The printed film is then fused to the plastic card using a high temperature bonding method producing superb quality plastic cards. Increased card printing productivity printing 140 single sided printed cards per hour, the high capacity card feeder tray can hold 250 cards and the card printer consumables print 500 prints per roll so you can print your cards without interruption. Robust build quality reflected in a 3 year warranty and life time warranty on the print head. The Avansia can print on all types of cards (PVC, PET, Polycarbonate, ABS etc..), including smart and contactless. The Evolis Avansia can be configured for many data encoding specifications: Magnetic stripe, contact and contactless smart cards. These encoding options can be combined in the factory. in Melbourne, Sydney, Brisbane, Perth, Adelaide & other locations around Australia.